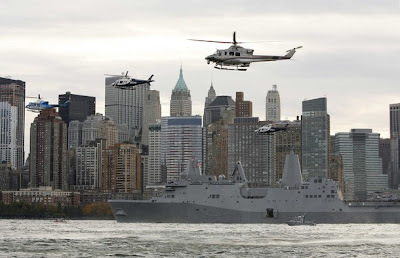 (Reuters Pictures) The USS New York sails past Ground Zero as it arrives in New York Harbor November 2, 2009. Steel salvaged from the World Trade Center is forged into the bow of the ship, which bears a crest featuring a phoenix rising from the twin towers and the words "Never Forget". h/t Life with Monkeys who said: "Never forget, never forgive, yet only eight years after that tragic day America has elected a president who took his American flag pin off because he said there was "too much patriotism" in the aftermath of 9/11...."